Do you like baking? Can you give a helping hand? As Christmas is coming near, why not enter your festive bake to raise money for Make-A-Wish UK? Fairy and Make-A-Wish® UK are encouraging the nation to get their baking hats on and share their festive recipes, as part of a competition to find the UK’s best festive cake. It can be anything from fruit infused baked Alaska, to orange and pecan yule log. You will need to submit your recipe in full; ingredients list and methodology on how you make it! The deadline is not long now, you have until 23 October 2015 to enter! So hurry and don’t miss out! Entries gathered will be whittled down to five finalists who will be invited to London, travel and accommodation paid for, to bake their recipes for a celebrity judge, Rochelle Humes on 3rd November. The final winner’s recipe will be the star of the show at a giant bake sale at Westfield, London and enough of their recipe will be baked to feed 12,000 people to raise money for Make-A-Wish UK. If you have any bake, please do enter and you might see your winning recipe at the giant bake sale at Westfield shopping mall from the 20th November to 22 November 2015. Hungry punters will be asked to make a £1 donation for a piece of the cake. For every plate washed over the weekend, Fairy will donate £10 to Make-A-Wish UK; they aim to wash 12,000 plates with just one 780ml bottle of Fairy! Did you know that as a nation, we are not baking traditional Christmas cakes anymore, in fact, 35% of us don’t even like Christmas cake and only 16% of us know what is Stir-up Sunday. A poll by Fairy has found that 64% of us are turning to alternatives like red velvet cake and chocolate cake, or adding a twist to traditional recipes. The majority of those surveyed will be going for an alternative cake or are likely to be adding exotic fruit, blueberries, vodka or carrots to their traditional mix. So put your thinking hat on and bake a festive cake to enter the Make A Wish competition! To get involved, click here for more information: https://www.supersavvyme.co.uk/home-and-garden/cleaning/contest/fairy-make-a-wish. Please read the T&C before entering! This is my first time making a Christmas Log and I am very pleased with the outcome. The log is basically a chocolate roulade or Swiss roll. In this recipe, I have made it flourless. If you prefer it to be more dense, then add the same amount of flour/caster sugar in it. Whisk the egg yolk until it combines. Then add the golden caster sugar and cocoa powder and mix well. Whisk the egg white until there are soft peaks and fold it together with the mixture. Bake for 15-20 minutes at 180°C. When baked, remove it and place a grill on top and cover it with wet tea towel. Place some icing sugar on the baking paper and place the Swiss roll on it. Whisk the double cream and spread it on the Swiss roll. Add some raisins into the cream. Now roll it up and place it in the fridge. Beat the icing sugar with butter together and add the melted dark chocolate. 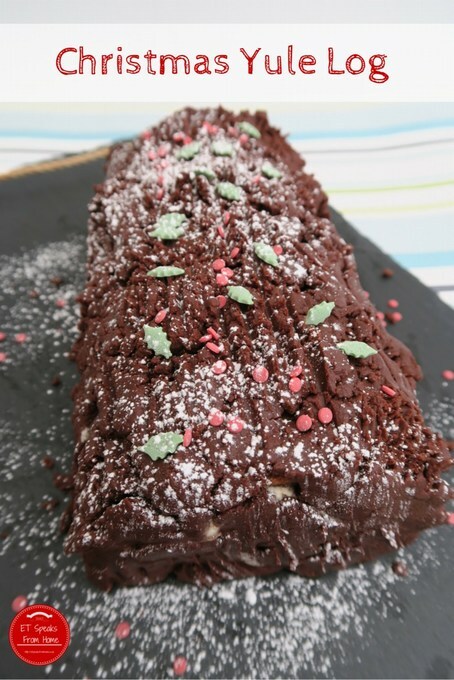 Spread the chocolate frosting on the Swiss roll and use a fork to make the lines of the log. If you want, sprinkle decorative candy on your Christmas log. So don’t wait and go and enter your festive recipe!